Plot: The richest man in the world refuses to pay his grandson's ransom and so begins a game of bartering for the young boy's life. 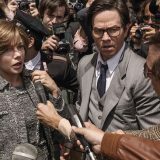 All The Money In The World is a fascinating insight into the power of wealth that brings with it a cold detachment the likes of which are synonymous with money. As such it is a film of calculated excellence. It’s difficult to discuss All The Money In The World without referencing the elephant in the room that is Kevin Spacey. After the Oscar winning actor had numerous allegations levied at him director Ridley Scott took the eye-widening decision to reshoot entire chunks of the film in order to replace Spacey with Christopher Plummer. The results are seemeless but while watching the film it’s hard not to have Spacey, and his now vilified persona lurking in the background. Based on actual events All The Money In The World sees teenager Paul Getty III (Charlie Plummer) kidnapped while in Rome. Back home his mother Gail Harris (Michelle Williams) receives a ransom phone call informing her that the safe return of her son will cost $17 million. While the kidnappers know she doesn’t have the money they are painfully aware that Paul’s grandfather J. Paul Getty (Christopher Plummer) is the richest man in the world. What no one bargained for was Getty’s refusal to pay anything, not a penny. And so begins a deadly game of chess with young Paul caught in the middle of it all. 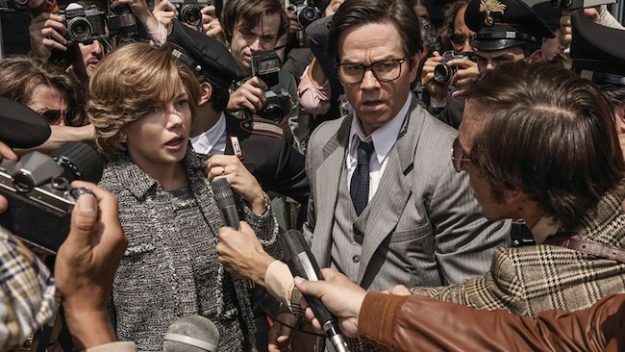 All The Money In The World is typical Ridley Scott, even in its smaller moments there is a sense of grandeur. At one point the overwhelming visuals style that have marked him out as one of cinema’s most arresting filmmakers goes so big it feels lifted from Lawrence Of Arabia. But it often comes at a cost of true character. On paper All The Money In The World is a period Ransom. Remember Ransom? Where Mel Gibson played a rich dude who refused to pay his son’s ransom? It’s a solid concept that gives way to a lot of interesting cat and mouse power plays but none of the characters here are particularly relatable. That is of course part of the film’s point, that when you have this much money you are not part of the ‘norm’. It is why young Paul’s voice over at the opening of the film says he hopes we can forgive them. Only Michelle Williams is moderately relatable, her Katharine Hepburn cut-accent a formidable match for the poe-faced steel of her former father-in-law refusing to relinquish his precious money. Towards the end Mark Wahlberg’s former CIA agent has some fun moments but for the most part you are left wondering what his true purpose here is. So while the film touches on moments of intrigue, mainly that Paul’s kidnapping could be an inside job from the family to milk any kind of money from the patriarch, the real interest comes in watching Plummer’s performance and wondering how the film would have differed with Spacey. Plummer is typically brilliant and plays Getty with a stonewall arrogance. But lurking beneath it is a hint of emotion that cannot help but occasionally peak through, like the sun behind thick clouds. With Spacey often at his best when being coldly ruthless, think Se7en and House Of Cards, his presence here might have given the film a true villain.